(Bloomberg) -- Wondering when the chaos in markets will cease? June 10. Or anyway, that’s the goofily specific target one analyst gets when overlaying charts from corrections since 1983 on this sell-off and assume Dec. 24 was its bottom. 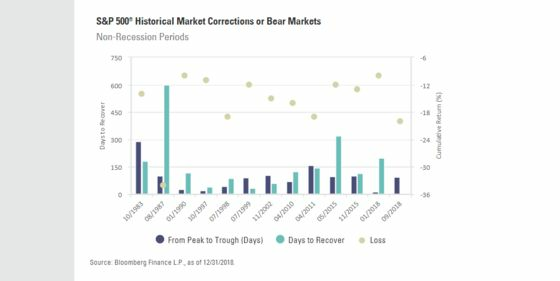 According to Matthew Bartolini, head of Americas research at State Street’s ETF business, it’s taken 168 days on average for the S&P 500 to bounce all the way back from a correction or full-fledged bear market over that span. Concerns ranging from slowing corporate and economic growth to faster rate hikes pushed the S&P 500 down as much as 19.8 percent by Christmas Eve and yanked $5 trillion from the value of U.S. equities. It took the index a month to recoup half of the losses -- the index is now down 10 percent from its peak. “The road to any potential June recovery is likely to be a bit rocky as the market’s trilogy of troubles (political brinkmanship, slowing growth, uncertain monetary policy) are not going to be resolved in a swift manner,” Bartolini said in a blogpost dated Jan. 15, adding that the path to recovery could take longer as U.S. economic growth is projected to decline in 2019 from a year ago.